My comparative version of No. 14 is the CPO recording with Johan Arnell and the Berlin Radio Symphony Orchestra. 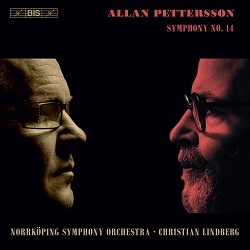 As with the Lindberg it’s available from eClassical, albeit in mp3 and 16-bit lossless only. There’s even a booklet, rare with CPO downloads, but the notes are clumsily translated. Also, CPO present the symphony as one track; that’s a pity, as separate cues are very helpful when it comes to the stop-start, compare-and-contrast nature of a detailed review. LP buyers will know that Sergiu Comissiona and the Stockholm PO, who premiered the piece in 1981, recorded it for Phono-Suecia shortly afterwards. The CD has been around since 1986 (review). Like most of Pettersson’s symphonies, No. 14 is a large-scale work that plays for almost an hour. And, as with its predecessors, it’s difficult to separate the teller from the tale. Indeed, as Andreas K. W Meyer points out in his CPO booklet, the composer told his biographer Leif Aare that that his music is a mirror of his life, a litany of its ‘blessings and curses’. That in itself puts these symphonies into a late-Romantic context, although at first hearing the novice might not think so. Pettersson held fast to conventional forms, leaving serial/post-serial experiments to his contemporaries. That said, Pettersson was no stranger to the twelve-tone system, and there are many passages in his symphonies that appear to flirt with it. The opening Presto of No. 14 is no exception, but the composer’s lyrical impulse reasserts itself in the next, rather wistful movement. There’s a decent stereo spread, balances are convincing and the playing is assured; the scurrying strings in the third movement are a special delight, the contrasting turbulence truly threatening. Lindberg is very much in control here, the work’s diverse strands melded into a robust and trenchant whole. Granted, this is not always the easiest music to listen to, but as with Pettersson's other symphonies there’s a clear connective thread beneath the tumult that’s easy enough to follow. As for the more austere writing – the start of the fourth movement, for instance – it has a well-defined shape that’s thrown into sharp relief by the forensic, soul-baring sound. The military drum – sans snare – adds terrific bite to the martial interludes; then, without warning, Pettersson lapses into a strange kind of languor, in which pensive pizzicati alternate with a slow, tolling motif. And in the fifth movement the music’s tendency to rasp and grind is leavened by the absorbing, ‘hear-through’ nature of the recording. Happily, the symphony’s climactic moments – dense and forbidding as they often are – they arrive in a way that’s not at all rhetorical. Again, there’s an evolutionary and organic aspect to Pettersson’s writing that binds everything together in a most convincing fashion. The sheer focus and commitment of these players – not to mention Lindberg’s sure, steadying hand – certainly make for an eventful and challenging ride. There are no easy answers here, no platitudes or false cheer; that said, the finale brings with it a modicum of rest or, perhaps, an air of quiet stoicism. Arnell is a little swifter than Lindberg in this symphony – 47 minutes as opposed to 52.38 – but there’s not much in it. The CPO recording – an analogue original from 1988 – is easy on the ear, and the Berlin Radio band play very well indeed. As a performance this is less stark – less confrontational, even – and I suspect some listeners will prefer that approach to Lindberg’s. In particular, Arnell achieves a degree of transparency in the work’s quieter moments that’s really quite beguiling; his colour palette is more subtle, too. In short, Arnell’s is a credible, intensely human alterative to Lindberg’s tougher, more elemental one. Lindberg fans will want this one; others may prefer to look elsewhere.